How A Tree Stump Is Removed | Mr. Tree, Inc. The stump of a dead tree can be a real nuisance in your yard. After removing a problem tree, many homeowners opt to leave the stump in place. This is not recommended for several reasons; if not removed, the stump can become a host to invasive insects and plant species, and the roots can even continue to grow and damage pipes, sidewalks, and other parts of your property as they do so. Rotting stumps can also become hosts to potentially toxic fungi, posing a health risk (as well as tripping hazard) to children and pets that play in your yard. With all of those potential risks, it’s better to remove dead tree stumps from your yard. There are a number of ways that you can do this. Burning the stump away is one option; however, as a tree stump decomposes, it tends to attract invasive insect species such as termites or carpenter ants. When a stump burns, these bugs will evacuate the stump and seek out the nearest source of suitable wood; often, this means your home! 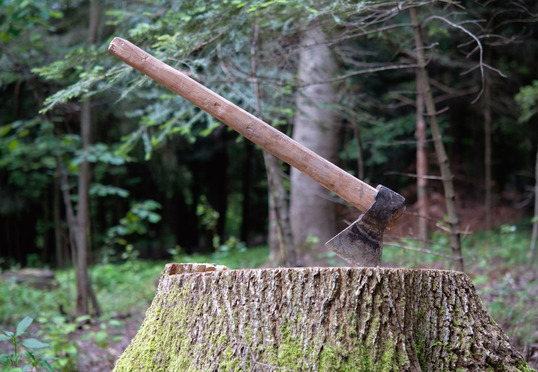 Another option is to use chemicals to accelerate the natural rotting of the tree stump; while this method is effective, it can take a long time, during which you will periodically have to chip pieces off of the stump as they soften. The fastest way to remove a rotten stump is through the use of a stump grinder, which is a large power tool that will quickly chip the wood away. These can be rented at many Oregon hardware stores. They can be quite large; stump grinders can range from the size of a lawn mower to the size of a truck and as such, you may need to pay to have them towed to your home. You will usually need to set aside most of a weekend to remove a tree stump with a stump grinder. Search local business to find the best place to rent a stump grinder; they can usually be rented from a hardware store for around $100-$190 per day. Make sure the dealer goes over all of the steps in operating the stump grinder with you, including how to power it on and off and any necessary safety precautions. You will also need a hatchet, chainsaw, and safety equipment. Make sure you have gloves, hearing protection, and eye protection whenever you are using heavy machinery. Before you do anything else, you’ll want to control the spread of the roots out from the tree stump. The roots of a tree can continue to grow even after the tree has been cut down. As they spread, they will seek water and can invade and clog pipes, as well as forcing cracks into nearby pavement and doing other damage to your property. Use an axe to chop through the roots where they connect to the stump. Doing so will allow the roots to decompose and make the stump easier to remove. To encourage the severed roots to decompose faster, dig up any exposed roots and cover them with compost. You can also spread your grass clippings and old leaves around to hasten the decomposition process. Make sure you periodically check on the roots to make sure they are decomposing. Before you start the actual process of grinding away the stump, you should make sure that there are no rocks nearby that can damage your equipment. If you have a chainsaw, you can speed up the process of removal by cutting away as much of the stump that’s above ground as you can. Doing this will shorten the amount of time you actually need to use the stump grinder. Once you are ready to do so, position the stump grinder at the base of the tree stump. Using the hydraulic lever on the device, raise the wheel until it’s a few inches above the stump. Keeping yourself by the control panel – and away from the wheel – start up the stump grinder and slowly bring the wheel down onto the stump. Grind away the wood until you have a hole about four inches into the ground. Once you’ve done this, lift the wheel again and move on to the next spot. Eventually, you will have ground all of the wood down and be left with a hole where your tree stump used to be. Once you’ve cleared away the stump, you can gather up all of the wood chips and fill the hole with topsoil. Or, if you have multiple stumps in your yard, you can move onto the next one and begin the process of clearing it out as well. Once your yard is clear of troublesome tree stumps, it is yours to do with as you wish. You can seed the soil with grass, plant a new tree, or put a picnic table in the space that you have cleared!